Today I was reading about an upcoming event in Bellingham, WA that really struck a chord with me. 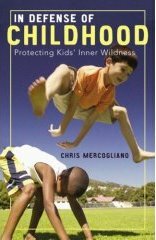 Educator and author Chris Mercogliano will be talking about his book, In Defense of Childhood: Protecting Kids’ Inner Wildness, at Village Books at 4pm this Saturday. He also emphasizes reading to children, and getting them outdoors to investigate, play and explore. I think I’ll try to make time to read this book. I wonder if Mr. Mercogliano actually does have the same philosophy of child-nurturing that I do. When the children were little, we did have order to our day. But once chores were done and meals were eaten, there was plenty of time left for the children to explore the forest behind the house, build forts in the bushes, put on plays in the living room and create works of art. When the children were indoors, I would sometimes spend hours a day reading to them, the length of time depending on how interested they were in the current book and whether it was a cozy, book-reading sort of day or not. When the children were older, we homeschooled, in a laid-back sort of way. I taught the children to read and taught them the fundamentals of math. We did use some text books. But, mainly, we relied on the library and the rule, “You need to read as thick a stack of non-fiction as fiction books!” If there was a certain subject to which I wished to introduce a child, I would check out some books on the subject and leave them lying around. They were usually read, and soon thereafter the excited child would tell me all about the new interest. Our homeschooling also involved taking the children everywhere with us, preparing them beforehand with what to expect, and what behavior would be expected of them. I let them know that if they weren’t able to behave, we would have to return home, but this rarely happened. Going out was a treat, and they wanted it! 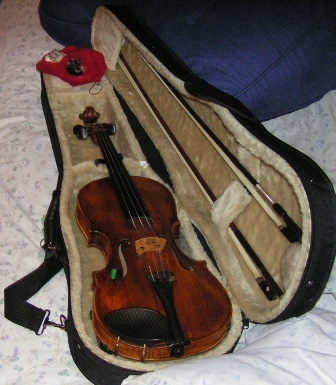 At one point, three of the children told me they were interested in learning to play violin, so violins were purchased and private lessons ensued, with melodious consequences. For art, we kept the home well-supplied with all things artsy and craftsy. The children used their imaginations, and then decided to view all the art videos available at the Bellingham Library to learn such things as colored pencil techniques, and how to paint with oils, acrylics and watercolors. I treasured those days of the children having time and opportunity to pursue interests and develop talents in a relaxed setting. There was plenty of time, too, to contribute to the work of the home, read books, go on hikes, and get enough rest! I think that all of these things were beneficial to the children, and helped them to become the independent thinking, curious, and creative people that they are. There is so much more to be said, especially since some of the grown children think a more “normal” life would have been better. But this is a topic for another day, since I’m so tired! This entry was posted on Wednesday, October 3rd, 2007 at 9:21 pm	and is filed under Books, Education, Learning. You can follow any responses to this entry through the RSS 2.0 feed. Both comments and pings are currently closed. I second the request for the post for another day. I was talking to one of your daughters at church the other day and she mentioned that she was not planning to homeschool her children. As a homeschooling mama myself, I would be interested to hear your take on that. Thank you, Kerri and Amy, for your comments. I will have to “interview” the children and do that “Post for Another Day”. Isn’t it so often the case that our children want something different from what they had? I think they would all say that they had a good childhood, though (I hope! ).